A youngster battles with an ice cream cone in front of the Ben & Jerry's ice cream shop in Montpelier, Vt., Tuesday, April 25, 2006. The ice cream maker held its annual free cone day around the world and expects to give away more than a million cones. 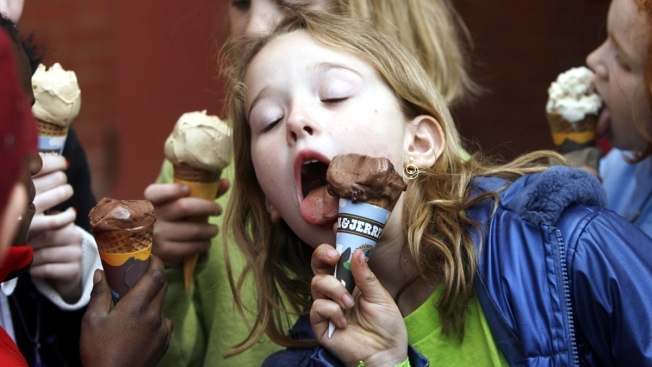 Tuesday is something of a holiday for ice cream lovers—Free Cone Day at Ben & Jerry’s. Forty years ago, the Vermont-based company gave out free ice cream cones to customers, as a thank you for their support during Ben & Jerry’s first year in business in downtown Burlington. Free Cone Day has grown in popularity ever since, expanding to scoop shops worldwide. "We’ll have about a million people—a million people—come in for free cones," Matthew McCarthy, the CEO of Ben & Jerry’s said in an interview with necn. "And to me, that’s super exciting, and also a little bit humbling: the fact that this is a business that started right here in Burlington and now touches the lives of a million people in just one day." Most scoop shops will serve up the freebies from noon until 8 p.m. Tuesday, but the company noted it is a good idea to make sure your local shop is participating. Ben & Jerry’s has made that info available here.